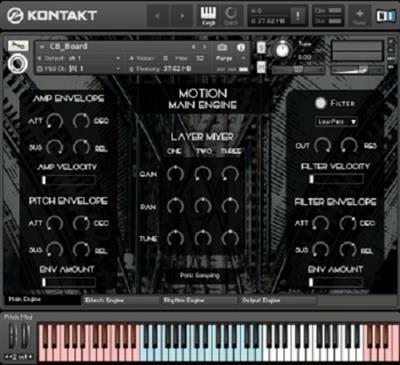 Motion Cinematic Grooves for Kontakt is a cinematic, hybrid scoring tool designed to give composers instantly inspiring rhythmic soundscapes that will immediately add drive and impact to cinematic compositions. The library is created from acoustic material recorded by composer and producer Olajide Paris. Paris has been the guiding hand behind several critically acclaimed libraries for the likes of 8Dio, Impact Soundworks, Audio Imperia, and Private Labs Audio. Motion consists of more than 1000 organic rhythms created from electric violin, contrabass, and electric bass, put through extensive sound design processes. All rhythms are tempo-synced and freely transposable to any key via keyswitches. Many grooves come in major, minor, and power chord variants. Though sourced from those three instruments, the sounds have been suitably mangled and stomped on, resulting in audio elements akin to anything from broken muscle car engines, to rhythmic chalkboard scrapings and the sonic pounding of ion propulsion systems sending alien vessels hurtling through space. The results of this sound design are truly inspiring, and make both perfect starting points and final finishes to scores and soundscapes alike. The library is built in a modified version of the open-source Photosynthesis engine for Kontakt which features extensive effects, modulation, and rhythmic control for nearly infinite possibilities. There's a lot of new beginnings in this library. Many of these sounds were crafted with the idea of igniting the spark of inspiration to set you off on your own rhythmic expedition, which is why we've taken the time to craft and mold some sounds that don't fit under the generic labels of many of today's sound design tools. Rhythm is often one of the first episodes in crafting a new song, and Motion easily provides that foundation. Musician's writer's block can hit even the most prolific of composers, we present you the cure. When designing soundscapes, it's often difficult to round them out with a fine finish that gets it moving and progressing from phrase to phrase. Motion was created with that idea, to move the sound forward, offering a final polish of bass and movement. Whether creating a rising tension in a video game track or horror movie, or needing a driving line to an industrial or heavy metal piece, Motion gets the job done.